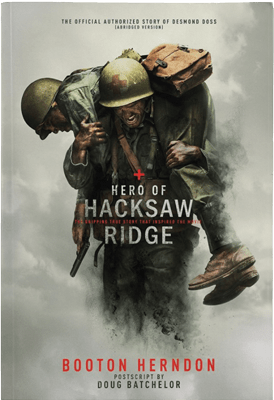 Your own copy of The Hero of Hacksaw Ridge, the official biography of Desmond Doss. Download this free eBook, The Faith of Desmond Doss, by John Bradshaw. Doss stuck to his principles and didn’t back down — even if it meant he was threatened with court martial. Why would a man risk his life to rescue those who had persecuted him so violently? Heroism or foolishness: What is selfless courage? He never carried a weapon, but Desmond Doss didn’t enter the war unarmed. Why were the Ten Commandments so important to Desmond Doss – particularly during times of trouble on the battlefield at Okinawa? Doss chose a morally difficult and physically dangerous middle path, voluntarily entering the mess and muck of war, offering help to both friend and enemy. Doss was an “even-better Samaritan” who intentionally placed himself in places of danger, discomfort and personal cost to serve others. Did Desmond compromise his Sabbath beliefs? It’s not everyday you hear about a battle being delayed so one man can finish his Bible study and prayer time — particularly when it’s a battle that’s critical to the success of the war your country is fighting. The story of a true hero unfolds in The Conscientious Objector, and it’s hard not to be moved, challenged and uplifted.